NIC now requires governmental corrections agencies, or those private or non-profit governmental service deliverers, to provide verification of successful completion of a minimum 32-hour Thinking for a Change Formal Facilitator Training. The purpose of this is to ensure those delivering the program are properly trained to implement and deliver the program to correctional clients with fidelity. If you have been trained to facilitate T4C, please fill out the form below to apply for access to T4C 4.0. Please allow up to 7 days from the time of your submittal. 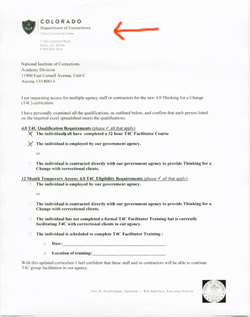 This agency approval letter is a requirement to apply for Thinking for a Change 4.0 access. The document may be downloaded here. It must be printed out on Government (local/state/federal) Sponsor Letterhead, completed and signed by an agency official. This upload-field is first so it does not get overlooked. Every field in this online form is required except "comments." You must fill this out completely and submit just once. A partially filled-out form will not be retained if you come back to it later. T4C 4.0 requires you either work for a governmental corrections agency OR contract with a governmental corrections agency to provide T4C to correctional clients. Please Choose One * - Select -I work for a governmental corrections agency.I contract with a governmental corrections agency to provide T4C to correctional clients.